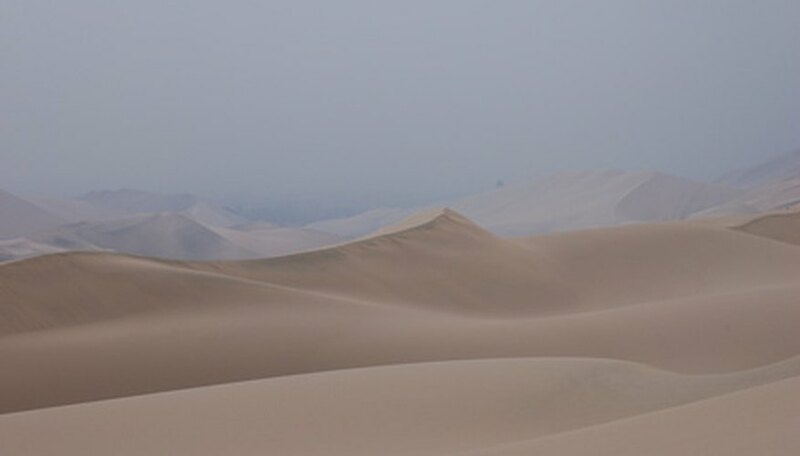 The Taklamakan Desert, in the Xinjiang Uyghur Autonomous Region of the People's Republic of China, is one of the largest sandy deserts in the world. There is virtually no water in the desert, but some oases are found where water runs from the mountains to low-lying areas. Areas in the transitional zone between these oases and the full-desert parts may have as much as 5 percent plant cover. Alhagi sparsifolia is a perennial desert legume that grows in the borders between various oases and full-desert areas in the Taklamakan Desert. Its wide distribution and perennial nature make it a good stabilizer for the sands around the oases. Alhagi sparsifolia is uniquely suited to desert life because it has a rare ability to take nitrogen from the air. Its high protein content makes it a valuable livestock fodder for people trying to live in and around the various oases of the Taklamakan. Scorzonera divaricata, which grows in the transitional areas between the oases and the desert, gets about 1 foot high west of Qira County. Scorzonera divaricata is a very simple plant that grows below partially stable or fully stable hills or on flat, sandy areas between the full desert and the oases. The flowers of this plant are hermaphroditic and are pollinated by insects from the nearby oases. Ephedra przewalskii is a shrub that can go dormant during dry periods of the year. It can grow 9 feet tall. The Ephedra przewalskii is a conifer and features needle-like leaves like any other conifer. Its natural range includes Kazakhstan, Kyrgyzstan, Mongolia, Uzbekistan, Tajikistanm, China and Pakistan. In China, it is found in north Gansu, Nei (Inner) Mongol, Ningxia, north Qinghai, Xinjiang and the Taklamakan Desert. It is usually found in China between 1,000 and 12,000 feet in altitude in areas that are dry and sandy. Nitraria sphaerocarpus is another bush that grows in areas similar to the range of the Ephedra przewalskii. It grows in higher altitude arid areas in the border areas between the oases of the Taklamakan and its full-desert areas. Like any other plant that can grow in a desert, the Nitraria sphaerocarpus is drought-resistant. How Long Does a Forsythia Bush Live?